HP targeted security-conscious business users and IT with Sunday’s announcement of the Elite x3 smartphone that runs Windows 10 Mobile. It ships this summer. HP designed the system so that workers can run basic Microsoft Office productivity apps across a large desktop keyboard, mouse and display, as well as smaller displays, when the phone is wired via an optional Desk Dock accessory equipped with a USB-C port. Security for the phone got a major boost, with both a fingerprint reader and an iris recognition camera, atop 256-bit key full disk encryption enabled by a fast Qualcomm Snapdragon 820 chip. The Elite x3 is a business-friendly Windows 10 Mobile smartphone with a 5.96-in. display. In addition to the phone and dock, HP announced a Mobile Extender device, basically a 12.5-in. display and keyboard in a clamshell design that, when connected to the phone, displays the files, apps and other data kept on the phone. The Elite x3 takes advantage of Microsoft’s multi-screen Windows Continuum experience to allow Windows apps to be displayed and controlled with other connected devices, with the smartphone providing the computing power. 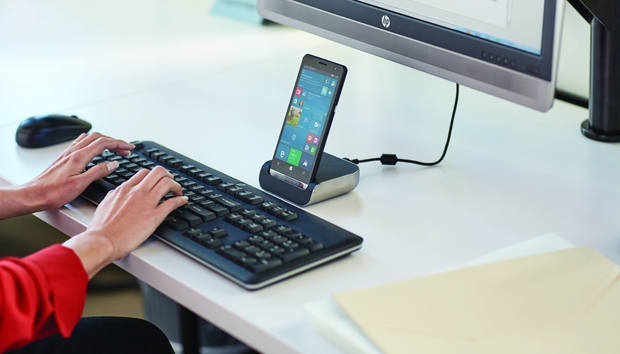 Microsoft in October described the value of its Continuum concept when productivity software is used with its $549 Lumia 950 and $649 Lumia 950XL smartphones if they are connected via a $99 Display Dock to full-sized keyboards and large desktop displays. HP didn't announce pricing for the Elite x3 or its optional accessories, but the phone is expected to fetch a premium price. However, the phone is also likely to be bundled with HP services and not priced separately. The phone's high-end features include a large 5.96-in. display with 2560 x 1440 pixel resolution and Gorilla Glass 4 durability. The phone runs the latest Qualcomm Snapdragon 820 processor, which has four processor cores running at 2.15 GHz. The phone will also have a microSD expansion slot to allow for up to 2TB of storage, atop its 64GB of internal storage. It has 4GB of memory. Along with a 16-megapixel rear camera and an 8-megapixel front camera, the phone includes two stereo speakers. There is a large 4150 mAh non-removable battery as well. HP boosted security management with both iris recognition in the front-facing camera and a fingerprint reader on the rear of the phone’s body. The Windows 10 Mobile software provides 128-key bitlocker encryption, as well as an enterprise-grade VPN. The Qualcomm processor allows for secure boot, 128-bit key image encryption, 256-bit key full disk encryption and more. The device supports Federal Information Processing Standards (FIPS) of 140-2 cryptography, which is widely required by U.S. government agencies. Even with so many bells and whistles to attract business buyers, some analysts are not sure whether HP and Microsoft will succeed in promoting Windows 10 Mobile phones. The advantages of using Windows productivity apps across different form factors with Continuum might lure some enterprise users already familiar with Office apps, but that might not be enough apps for the broad array of software that workers need. HP added the Salesforce1 mobile app to the phone for customer relationship management, as well as its HP Workspace software and the Adobe PDF Reader. Still, it is unclear how HP and other Windows 10 Mobile phone makers are going to erase a 10% decline in Windows Phone shipments recorded by IDC for all of 2015. Overall smartphone growth is expected to slow with greater intensity over the next five years, according to IDC. The analyst firm put the Windows Phone OS at just 2.2% market share for all of 2015, compared to 81% for Android and 16% for Apple’s iOS. "Despite all the effort Microsoft has put in the launch of Windows 10, IDC does not expect Microsoft's share of the smartphone OS market to grow much over the coming years," IDC said in December. Analyst Patrick Moorhead of Moor Insights & Strategy was more optimistic. He said the Elite x3's ability to link to desktop monitors, keyboards and other devices is a "fascinating use case … that will promote Windows Phone." The technology will not only allow Microsoft productivity apps to work with Continuum, but also with other 32-bit apps that are virtualized in the cloud to give companies more flexibility. Moorhead said the Elite x3 is the first generation of a modular system that will catch on in businesses, and predicted it will grow to be in 10% of workplaces within five years.